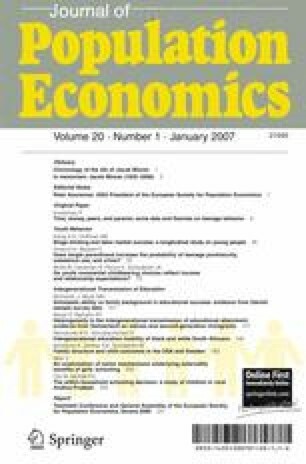 This research examines the role of scholastic ability and family background variables in the determination of educational attainment in Denmark. A categorical representation of the highest level of education attained by the individual is the dependent variable. It is analyzed by procedures that take account of the presence of unobservable factors. Parent’s education and occupation, along with an indicator of scholastic ability which is represented by a set of aptitude tests, explain a small but significant portion of the variation in their children’s educational success. Women are shown to respond differently to their environments than men, and including these test scores does not remove the need to deal with unmeasured attributes. On the basis of the available data, family background variables as a group contribute more to the explained variation in the data than the test scores. Finally, credit constraints do not appear to be a factor in educational attainments. Financial support from the Danish Research Council is gratefully acknowledged. We thank Gøsta Esping-Andersen, Jens Bonke, Claudia Buchman, Else Christensen, Mariah D.R. Evans, Anders Holm, Stephen L. Morgan, Helene Skyt Nielsen, Torben Tranaes, Jørgen Søndergaard, Wout Ultee, Mary Beth Walker, Christopher Winship, and two anonymous referees for comments on earlier versions of the manuscript.